Skull tattoos can have a lot of different meaning, depending on how the skull is used. A human skull with large, gaping, eye sockets can look very visually striking. However, the skull has long been regarded by most cultures as a symbol of death. Skull tattoos could therefore be used to show that the wearer has no fear of death. A skull tattoo could say that the wearer has accepted their own mortality and is actually pretty cool about the whole thing! They could also be used to remind the wearer that they will one day die and should therefore live each day to the full. Because of this association with death, skull tattoo designs can also be a good choice to commemorate the death of a friend or loved one. While some skull tattoo designs can be made to look quite scary, colorful skull tattoos can be quite the opposite! It was once common for Skull tattoos to be sought after by a certain type of person who wanted to project a dark and menacing persona. 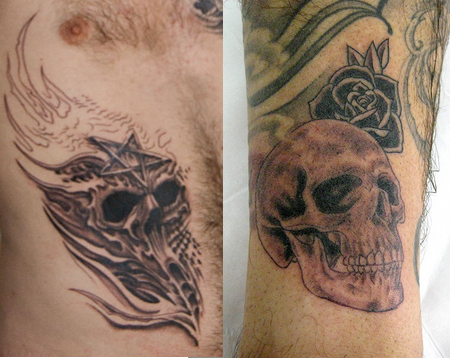 Skull tattoo designs are often used for prison tattoos and gang tattoos. Many bikers wear a skull tattoo as a talisman to protect them from death! From an artistic stance, Skull tattoos can be very effective tattoo designs both on their own and when combined with other imagery, such as: Animals, Banners, Dice, Flames, Flowers, Playing cards, Weapons, Wings, the possibilities are endless! Skull tattoo designs can be very versatile, a talented tattoo artist should have little trouble making a design to fit anywhere on the body. They can also be combined with other styles. A detailed skull tattoo design with a tribal tattoo background can look very striking. Sugar Skull Tattoos, Candy Skull Tattoos and Mexican Skull Tattoos. The Day of the Dead, El Dia de los Muertos in Spanish, is a festival in Mexico where skulls play an important part. Families gather to remember their departed. As part of the celebration, beautiful skulls are made from sugar and candy and eaten by the celebrants. In homage of this festival, many women choose sugar skull tattoo designs which can be decorated with colorful flowers and look visually stunning. Skull Tattoos for Men. A Skull tattoo design can be a great choice for men wishing to show they have no fear of death or have accepted that it is inevitable. Skull Tattoos for Women. Skull tattoo designs are not only for guys. A girl might choose one for similar reasons. You could make a skull tattoo design more feminine by giving it heart shape eye sockets. Skull Sleeve Tattoos. A Skull tattoo design could easily become a Skull Sleeve tattoo design. A talented tattoo artist could easily come up with a great design to cover an entire arm or leg. Skull Crossbones Tattoo. Think of yourself as something of a pirate? Skull Crossbones tattoo designs are great for people who want to show that they live by their own rules. Skull and Rose Tattoos and Skull Flowers tattoos. A skull tattoo design can look very striking when contrasted with colorful flowers or roses. Perhaps you want such a tattoo to commemorate a friend or loved one. Deer Skull Tattoos. The meaning of deer skull tattoos often imply the balance of life and death; transition from the physical to the spiritual body, or even just longevity. The English word Skull is most likely derived from the Old Norse word ‘Skalli’, which meant bald. The image of the Skull has long been associated with death. This probably began with the use of the skull and crossbones to mark the entrances of Spanish cemeteries – a tradition which goes back many centuries. As Spanish colonies spread around the world, the image of a skull and crossbones quickly came to signify death elsewhere. The image of a skull – both on it’s own and sometimes with crossbones – was used by pirates on their Jolly Roger flags in the 17th and 18th centuries. These flags were flown to inspire terror and encourage their victims to surrender quickly. The flag warned that if the victims gave the pirates too much trouble resisting they would all be slaughtered! Many different styles of Jolly Roger were used and some of these can be great inspiration for skull tattoo ideas today. Because of the life-style they led – living on the fringes of society and creating their own rules – pirates remain a source of inspiration to many people today! A pirate inspired tattoo can be a great way for a person to express their own ideals of freedom and individuality. Because of it’s association with death the skull also became popular with many armies around the world. In Germany the symbol of a skull, both on it’s own and with crossbones, was called a Totenkopf (German for Deaths head). Hussars of Frederick the Great are pictured in 1744, wearing grim black uniforms and with Totenkopf designs on their hats. The association of the Skull and Crossbones motif with death continued in 1829, when New York State required a Skull and crossbones be used to label containers of poisonous substances. This tradition of the Skull and Crossbones as a warning against poison and death continues in many countries today. Perhaps most famously – or rather infamously – the image of the Totenkopf made it onto the uniforms worn by members of the Nazi SS during World War 2. The skull and crossbones continues to be such an enduring image, that it remains a popular choice for many military units throughout the world today and a great inspiration for many tattoo ideas in general and skull tattoo designs in particular. Actor Ben Affleck has a Skull and crossbones tattoo design on his right arm. Singer, Rihanna has a feminine skull tattoo on the back of her left foot. Guitarist Slash has a skull with roses tattoo design on his left arm. Actor Nicholas Cage has a flaming skull tattoo design on his left arm. Kelly Osbourne has a skull and crossbones tattoo design on each foot. Actor Mickey Rourke has a Native American bulls skull and feathers tattoo design on his right arm. Where on the body can you wear a Skull Tattoo? Skull tattoo designs are very versatile and can be worn almost anywhere on the body. A talented tattoo artist should be easily able to draw you a design to fill almost any area and amount of space desired. Skull designs also look great on their own, or as part of a much larger design. Combining skull tattoos with roses or flowers can be a great way of adding colour to contrast with the skull and slightly softening the menacing aspect of the design. 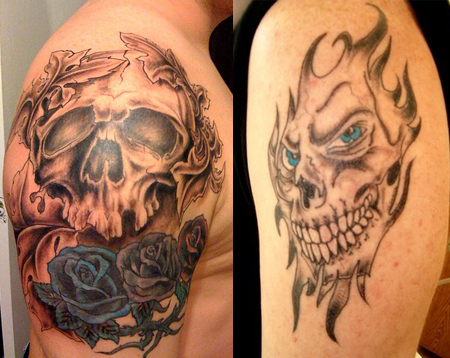 It is also possible to combine a Skull tattoo design with another tattoo style or design. A skull tattoo design on a tribal background might look very effective. Many people also combine skull tattoo designs with a banner containing text or writing. If you are thinking about getting a skull tattoo design you only need to look online to see many very fine examples of skull tattoo pictures, skull tattoo images and skull tattoo body art to help inspire your own tattoo ideas – including examples of skull tattoo flash. What does a tatoo ski mask skull mean on the left side of a female chest? Is the any meaning for a human head covered by a animal skull?